Like you, I care deeply about Los Angeles – this imperfect paradise we call home. It’s where millions of people come from all over the world to provide a better life for themselves and their families. Today, we are faced with one of the toughest challenges to impact our community in our lifetime – the growing homelessness crisis. We cannot ignore the encampments on the streets and freeway overpasses of Los Angeles. Tens of thousands of men, women, children and veterans are living on our streets on any given night. Once a month, my family cooks and serves dinner to homeless men and women at the Dolores Mission near downtown Los Angeles. The ability to provide a hot meal, a friendly face and a respite from the streets is something we feel blessed to be part of, but it is not enough. We know that what is needed is a long-term solution that gets to the root cause of this ever-growing issue: housing with supportive services. At the California Community Foundation (CCF), we are grateful to generations of donors that have partnered with us in addressing homelessness. Most recently, as the numbers continue to climb, we have been focusing our resources on building more permanent supportive housing. Individual dollars to feed and clothe our homeless neighbors are important and much needed. But permanent supportive housing, which combines long-term affordable housing with critical services such as job training, case management and health care, can drive systemic change to end our homelessness crisis. It is effective and affordable. This year, CCF, with other philanthropic partners, committed funds to leverage $65 million for the launch of 1,000 new homes, more than tripling current production. And this November, voters will have a chance to address this need. 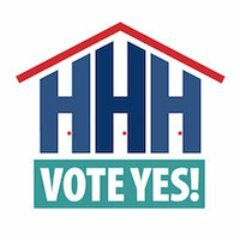 Proposition HHH is a housing bond on the November 8 ballot for City of Los Angeles residents that will raise $1.2 billion over 10 years for housing for our homeless. It has a broad coalition of supporters from all sectors. The business, government and nonprofit communities have joined forces to say, now is the time to act. We know that this bond will not solve all of our challenges around homelessness, but it is a critical step. Other funding from philanthropy, private investors and government will be needed. This is only the second time in CCF’s 100-year history that we have endorsed a ballot initiative. The stakes are too high not to act. We are at a tipping point in Los Angeles: do we want to continue to see our fellow Angelenos struggle on the streets, or do we want to contribute to a proven solution to help people for many decades to come? I hope you will join us in supporting Proposition HHH and ensuring all of our fellow Angelenos have a decent place to call home. You can click here for ways to get the word out to your friends, family, neighbors and coworkers, or visit YesonHHH.com to learn more.